Doing a Google Image search on a man in a loincloth was a bit disturbing. I'm glad I found this picture, though. 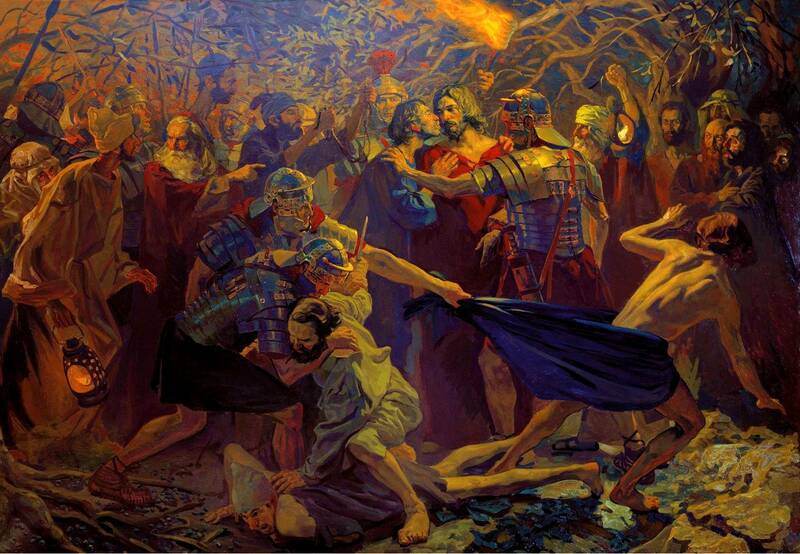 It's a painting by Pavel Popov that, for me, shows the chaotic environment that existed at the time of Jesus' betrayal. Disciples are in a panic, someone is about to get his ear cut off, and the man in the linen cloth is fleeing. It seems as if the soldiers are just grabbing at anyone to take them in for questioning. Perhaps this is why the linen cloth guy fled so rapidly and, well, nakedly. This week, instead of three sources with one opinion apiece, I found one source that provided multiple options as to who this man might have been. Because Mark describes the young man as a neaniskos, meaning he was in the prime of his life, perhaps 15 to 25 years old, and because Mark uses the verb sunekolouthei, which means "was following as a disciple" or "was accompanying," one option is that the man was probably a disciple of Christ. This makes sense to an extent because no one seemed to be surprised at his presence. However, the man is not called by name, and if he was indeed a disciple, why would this be so, considering that readers have already been introduced to the disciples in chapter 3? Perhaps the young man was sleeping in the house where Jesus ate the Last Supper and rose hastily from bed to follow Jesus to Gethsemane. Readers know from reading both Matthew and Mark that Jesus has many followers, several who upon meeting him, dropped everything to follow him. Also in this source, a man says that since this brief incident is found only in this Gospel, it might be Mark’s way of saying, "I was there." If the Last Supper took place in the home of John Mark’s mother (Acts 12:12), Judas Iscariot may have returned there first to betray Jesus. We can then understand how John Mark would be roused, perhaps grab a sheet to cover his body, and rush to Gethsemane to warn Jesus. That is a plausible idea, but this third option is where it gets interesting (and slightly complicated). This idea is based on the belief that this story is not factually true. There are two words that must be made known: historie and geschichte. Historie refers to actual events, while geschichte refers to the meaning or significance of the story. Basically, it's what we talked about in class several times. Does a story have to be factual in order to be true or contain a truth? Also, the Greek word for linen cloth was sindon. A sindon was a linen cloth used for clothing or burial. The word is used exactly four times in the Christian Testament: in the three synoptic gospels to describe the cloth in which Jesus’ dead body was wrapped for burial... and here. It doesn't matter who this man was. What's more important is what his story means, the geschichte. This incident was symbolic of something else, namely baptism. Baptism was originally a metaphor for death and resurrection/rebirth, in which one dies to one’s old way of life and is “born again of water and the Spirit.” Those who were baptized were submerged in “living” water, symbolizing both drowning and amniotic fluid, and came out of the water as naked as the day they were born the first time. It is possible that this incident was either symbolically describing the young man’s baptism into Christ or possibly symbolically describing Jesus' "baptism" into his new life. Remember that for no reason that Mark ever explains, the Roman soldiers who have walked through the dark and cold of night on the holiest night of the year, specifically to arrest Jesus, try to grab this young man; but he escapes as naked as the day he was born, leaving behind only the sindon, in other words, leaving behind only the evidence of Jesus' approaching death to his old life and resurrection into the new. Did that make sense? Also serving as a symbolic theme is the idea that the naked man and the man at Jesus' tomb, who is commonly believed to be an angel, are the same person. As I mentioned earlier, Mark uses the Greek word neaniskos to describe the naked man. Fascinatingly, the word neaniskos, which is rare in the Christian Testament, crops up a second time in Mark to describe the young man in the long white robe who tells the women disciples that Jesus has been raised and they will see him again in Galilee. In the end, I'm still not sure which choice seems the most logical to me. I do like the idea about the man sleeping in the "Last Supper house" being so eager to follow Christ that he followed him in his undies. However, Mark never explicitly tells readers that there were even other people in the house during the supper. All of these ideas are merely speculation. Perhaps this man will remain a mystery.